In this video we walk through some of the most significant improvements that have been made to Drupal 8's user interface and user-facing features. Among other things, we mention improvements to the block system, comments, content editing, administrative experience and more. As we go through each improvement, you'll see a demonstration of each feature, which is great for a quick immersion in Drupal 8's interface. Before we dive into the changes that have been made to the Drupal 8 interface let's start by painting a broader picture of the kinds of improvements that have been made for both users and administrators. First of all, Drupal is responsive out of the box, which means that it can fit to a variety of screen sizes, from mobile phones to desktop browsers, and the responsiveness extends to the administrative section, so you can manage your site from your phone. There are also new APIs that contribute in modules and themes can plug into to make responsiveness even easier. In Drupal 8 the views module,which is responsible for creating lists of content, is now in core, which means that virtually any list of content that you see on Drupal, both on the frontend and the administrative section, is now a view that can be modified and adjusted, just like you can modify any view. 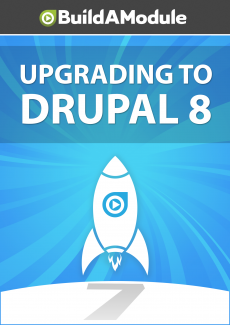 This also means that you can do a lot more with Drupal out of the box. Next, the blocks system has been completely overhauled. Now we can have multiple instances of the same block in multiple regions of a page. Nearly every element of this site that used to be part of the theme has now been embedded in the block, which can be enabled, disabled or adjusted, making it less necessary to use contributed modules to get the same effect. You can also have different types of blocks and each type of block can have its own set of fields. So blocks have become as extendable as content types. Drupal 8 comes bundled with a WYSIWYG now, so when we edit content we don't have to write an HTML or markup. This is so important for some of our less geeky users and it can really speed up the editing process. The WYSIWYG is fully configurable and you can have different WYSIWYGs for different users and different text formats. In addition to the WYSIWYG, Drupal 8 supports in-place editing. So if we're on a page with some content we can edit any aspect of that content in-line. Drupal 8 has been upgraded to HTML5, and this has many implications, only a few of which are userfacing. One of those is that we can now use HTML5 input types, like date fields, email addresses and more. It also means a huge win for accessibility and for clean HTML code. When it comes to working with the file system Drupal 8 has had its entire file structure reorganized to be more intuitive to the initial user. Custom themes go in the themes folder, custom modules go in the modules folder, and the code that belongs to core, which isn't something we should be modifying or working with, ends up in the core folder. So it's a lot easier to know what you can modify and what you shouldn't. Drupal 8 has improved multilingual support. Through a pretty straightforward user interface you can enable multiple languages, translate nearly any aspect of the interface or any aspect of the configuration, like custom views and blocks, and also any content. It's easier to search for content that hasn't been translated yet and through these tools you can also make adjustments to the interface text without having to use any contributed modules.